Jorge (HOR-heh) Mario Alfaro (al-FAR-oh)… Has one son, Abiel (born 9/24/15)…2009 graduate of Instituto Técnico Industrial Antonio Prieto, where he played baseball and soccer…his father was a soccer player and competed for a spot on the Colombian National Team…his younger brother, Jhoandro, is also a catcher in the Chicago White Sox organization…hobbies: watching movies and TV shows and listening to music. Made his first career Opening Day roster with Philadelphia...Among all National League rookies, finished seventh in hits (90), tied for seventh in doubles (16), eighth in total bases (140) and extra-base hits (28), ninth in home runs (10), tied for ninth in RBI (37), 10th in average (.262) and slugging (.407), and tied for 10th in multi-hit games (18)...Among all NL players, ranked tied for eighth in hit-by-pitch (14)...Tied for first in the NL (tied for fourth in MLB) with 21 base runners caught stealing. 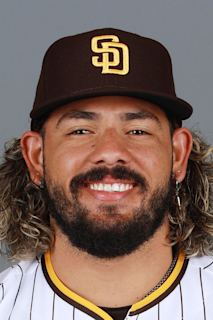 Made 3 starts for Team Colombia during the World Baseball Classic... Began the season with Lehigh Valley (AAA)... Named an International League midseason All-Star... Recalled on 8/4... At the time of his recall, led all IL catchers in games (77), total chances (634) and putouts (590)... Made 29 ML starts: 28 at catcher and 1 at 1st base... Reached base safely in 26 of his 29 ML games/starts and hit safely in 23 of the 29... Hit .467 (7-15) with RISP... Began his ML season with a 9-game hitting streak, 8/5-23 (.324, 12-37) and overall had a career-best 10-game hitting streak, 9/25/16-8/23/17 (.325, 13-40)... Walked in his first two plate appearances (one intentional) on 8/25 vs CHI, after drawing just one walk in his first 54 career PA (15 G)... Clubbed his fi rst ML HR, 8/15 at SD (Dinelson Lamet)... Threw out 4 of 17 (23.5%) attempted base stealers in the major leagues; was 15-for-46 (32.6%) with Lehigh Valley. Garnered Carolina League midseason and postseason All-Star honors, ranking among the league leaders in both RBI (3rd) and home runs (T6th, 13) despite a late season promotion to Frisco (AA)...named the 2nd-best prospect in the Carolina League by Baseball America...played in a career-best 121 games with Myrtle Beach (A+) and Frisco, batting .261 (127-486) with 17 home runs and 87 RBI...threw out 25 of 88 (28.4%) attempted basestealers overall...threw out 19 of 72 (26.4%) would-be basestealers with Myrtle Beach, good for the 3rd-highest percentage in the CL...was the starting catcher for the World Squad at the All-Star Futures Game in July...promoted to Frisco on August 4 for the remainder of the season. Tabbed the 14th-best prospect in the South Atlantic League by Baseball America...appeared in 104 games with the Crawdads, ranking among the club leaders in doubles (3rd, 22), runs (5th, 63), home runs (5th, 16), and RBI (5th, 53)...threw out 27 of 75 (36%) would-be basestealers, 2nd-highest percentage in the SAL...logged 16 games at first base and 82 games behind the plate...suffered a fracture on his left hand following a hit-by-pitch on June 28 at Charleston...was on the disabled list from 6/29-7/28 with a fracture of a finger on his left hand...was selected to the All-Star Futures Game, but did not participate due to hand injury...was promoted to Myrtle Beach on 8/31 for final weekend of the season and the postseason...hit .333 (2-6) with a double in 2 postseason games...continued season in the Arizona Fall League, batting .386 (27-70) with 6 doubles, a triple, and 11 RBI in 19 games for the AFL Champion Surprise Saguaros...selected to the AFL All-Prospect Team...ranked among the AFL leaders in batting (2nd), runs (T5th, 18), and doubles (T7th)...threw 7 of 14 (50%) attempted base stealers, 2nd-highest rate in the AFL...batted .367 (11-30) with 3 doubles, a home run, and 5 RBI over 8 games with the Toros in the Colombian Winter League. Appeared in 29 games at catcher, 28 at DH, and 17 at first base with Hickory (A)...threw out 6 of 40 (15.0%) would-be base stealers...was on disabled list, 4/13-20 with hamstring strain...returned to disabled list from 4/22-6/10 with the same injury...batted .292 (19-65) with 2 doubles, a triple, 2 home runs, and 10 RBI in 18 games with Ponce in the Puerto Rican Winter League...participated in a development camp for hitters at Rangers Ballpark in January. Spent first season stateside with Spokane (SS)...named the 8th-best prospect in the Northwest League by Baseball America, while also tabbed as the catcher on the same publication's Short-Season All-Star team...tied for the team lead in home runs (6)...threw out 15 of 69 (21.7%) would-be base stealers. Spent first professional season with DSL Rangers...ranked among the team leaders in doubles (T7th), triples (T3rd), and RBI (4th). February 7, 2019 Miami Marlins traded C J.T. Realmuto to Philadelphia Phillies for C Jorge Alfaro, RHP Sixto Sanchez, LHP Will Stewart and Future Considerations. August 4, 2017 Philadelphia Phillies recalled C Jorge Alfaro from Lehigh Valley IronPigs. March 17, 2017 Philadelphia Phillies optioned C Jorge Alfaro to Lehigh Valley IronPigs. October 27, 2016 C Jorge Alfaro assigned to Tiburones de La Guaira. September 11, 2016 Philadelphia Phillies recalled Jorge Alfaro from Reading Fightin Phils. August 28, 2016 C Jorge Alfaro assigned to Reading Fightin Phils from Lehigh Valley IronPigs. August 27, 2016 Philadelphia Phillies optioned C Jorge Alfaro to Lehigh Valley IronPigs. August 26, 2016 Philadelphia Phillies recalled Jorge Alfaro from Reading Fightin Phils. May 7, 2016 Reading Fightin Phils activated C Jorge Alfaro from the 7-day disabled list. April 19, 2016 Reading Fightin Phils placed C Jorge Alfaro on the 7-day disabled list retroactive to April 18, 2016. March 18, 2016 Philadelphia Phillies optioned C Jorge Alfaro to Reading Fightin Phils. December 2, 2015 C Jorge Alfaro assigned to Tiburones de La Guaira. October 5, 2015 Philadelphia Phillies recalled Jorge Alfaro from Reading Fightin Phils. September 30, 2015 C Jorge Alfaro assigned to Tiburones de La Guaira. September 21, 2015 Reading Fightin Phils activated C Jorge Alfaro from the 7-day disabled list. August 27, 2015 Reading Fightin Phils sent C Jorge Alfaro on a rehab assignment to GCL Phillies. July 31, 2015 Philadelphia Phillies optioned C Jorge Alfaro to Reading Fightin Phils. June 11, 2015 Frisco RoughRiders placed C Jorge Alfaro on the 7-day disabled list. March 23, 2015 Texas Rangers optioned C Jorge Alfaro to Frisco RoughRiders. November 20, 2014 Texas Rangers selected the contract of Jorge Alfaro from Frisco RoughRiders. August 4, 2014 C Jorge Alfaro assigned to Frisco RoughRiders from Myrtle Beach Pelicans. March 3, 2014 C Jorge Alfaro assigned to Texas Rangers. August 31, 2013 C Jorge Alfaro assigned to Myrtle Beach Pelicans from Hickory Crawdads. July 29, 2013 Jorge Alfaro roster status changed by Hickory Crawdads. July 21, 2013 Hickory Crawdads sent C Jorge Alfaro on a rehab assignment to AZL Rangers. June 30, 2013 Hickory Crawdads placed C Jorge Alfaro on the 7-day disabled list. March 9, 2013 C Jorge Alfaro assigned to Texas Rangers. November 1, 2012 C Jorge Alfaro assigned to Leones de Ponce. June 10, 2012 Hickory Crawdads activated C Jorge Alfaro from the 7-day disabled list. April 24, 2012 Hickory Crawdads placed C Jorge Alfaro on the 7-day disabled list. April 21, 2012 Hickory Crawdads activated C Jorge Alfaro from the 7-day disabled list. April 14, 2012 Hickory Crawdads placed C Jorge Alfaro on the 7-day disabled list. April 3, 2012 C Jorge Alfaro assigned to Hickory Crawdads from Spokane Indians. June 17, 2011 Jorge Alfaro assigned to Spokane Indians from AZL Rangers. May 27, 2011 Jorge Alfaro assigned to AZL Rangers from DSL Rangers. June 14, 2010 DSL Rangers signed free agent Jorge Alfaro.